TDI stands for "Turbocharged Direct Injection". 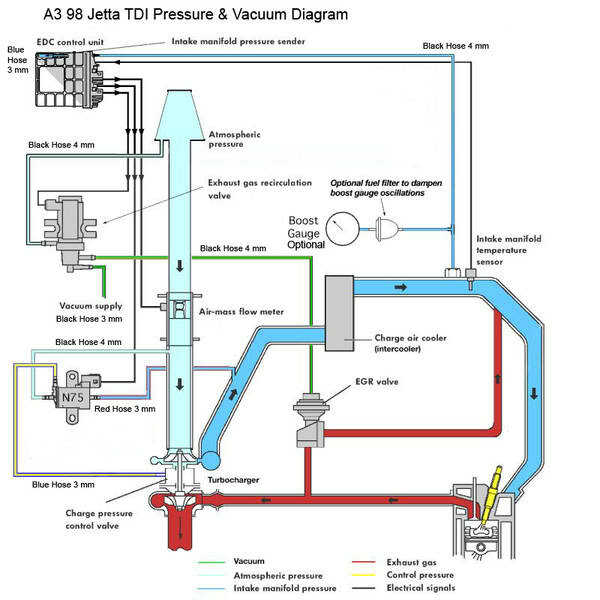 TDI is a fuel injection system in a diesel vehicles. A fuel injection system Plays a vital role in the design of a car. The car owner should know about the technology used for the injection system and his / her car. The terms like CRDI and TDI are very common in automobile engineering. The world wide famous brand Volkswagen uses TDI fuel injection Technology in their vehicles. Tdi has the facility of turbo charging and direct fuel injection into the engine cylinder. The fuel injector injects the fuel into the engine and spray it in the combustion chamber. The direct injection atomizes the fuel and transfer it to the combustion chamber. Turbocharger present and system increase the amount of air during combustion or when intake of fuel takes place. It helps in better combustion. An intercooler is provided in the TDI that help in lowering the temperature. Due to this the amount of fuel injected can be increased for combustion.TDI has less open surface which helps cut down the heat losses and ultimately increase the engine efficiency. This useful Technology was developed by Volkswagen group. Most of the vehicles of Volkswagen group uses this technology in their vehicles. Volkswagen uses this technology in the commercial vehicle and marine engines. With the use of this technology vibes great power and more efficiency. 1. TDI uses turbocharger from exhaust to increase the engine power and efficiency. 2.If we compare the efficiency orbit Technologies, CRDI seems to win. The reason is that CRDI uses sensor and has injector pipe to provide the fuel as per the necessity. So in this criteria CRDI is better than TDI. 3.The cost of TDI engine is less. but TDI is less efficient so it Consume more fuel and money. in other words, operational cost of TDI is expensive than other fuel injection technology like CRDI. 4. TDI is specially developed exclusively for Volkswagen group Vehicles..
5.The design of TDI Technology is simple. 6.Maintenance of TDI is Economical.